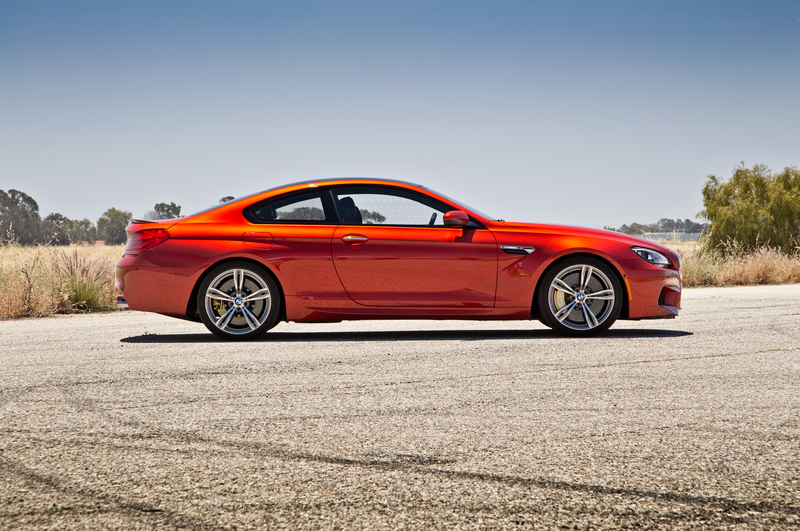 The 2013 BMW M6 is larger and heavier but more efficient and also quicker than its predecessor. 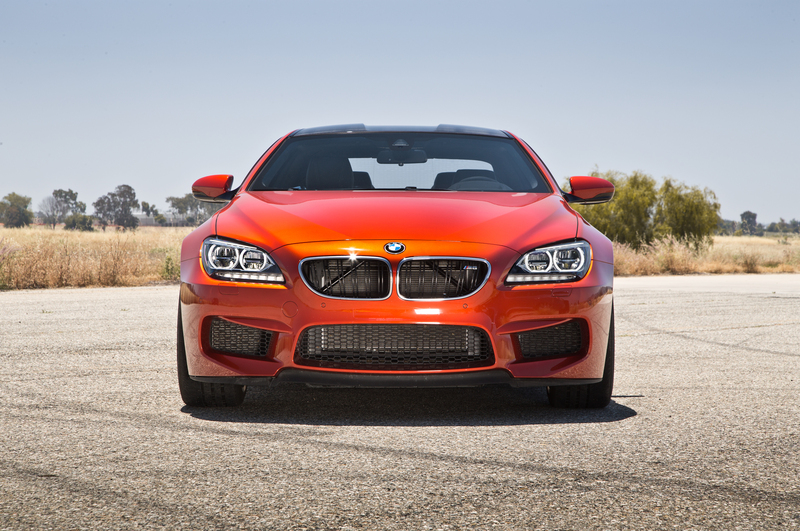 With Sakhir orange metallic paint and a naked carbon-fiber roof, it also tends to attract attention. If you enjoy getting thumbs-ups from Slurpee-sipping Best Buy employees and having camera phone pictures taken by drivers of two-generation-old 3 Series with coffee-can exhaust tips, you’ve found the right color for your new M6. Color aside, the M6 is a fairly sleek-looking thing, long and low, hunched on its available 20-inch, five-spoke wheels. While BMW’s new M6 is down two cylinders to the outgoing car, those looking for a brute of a sports coupe shouldn’t be disappointed. In place of those two cylinders are two turbochargers that force 560 hp and 500 lb-ft of torque from the front-mounted 4.4-liter V-8, and that’s enough power for our two-and-a-half ton tester to hit 60 mph in 4.0 sec. Torque is nearly instantaneous and the sound, while a little muted for our taste, is ferocious in tone at the 7200-rpm redline . The seven-speed dual-clutch transmission works well, with fairly snappy manual shifts in the fastest setting. (Shift speed can be adjusted up and down with a proportional loss or gain in smoothness.) Power isn’t everything, though. While the M6 feels strong rocketing down the highway or blasting from a stoplight, it feels a little less in its element when you point the nose towards your favorite bit of winding road. It’s not that the M6 isn’t capable — it is. We got 0.99 g of lateral acceleration on our skidpad and the car rocketed through the figure eight in a competitive time for its class. But despite all that grip and all that power, the M6 doesn’t move or communicate as well as lighter, sportier cars in this price range. Initial understeer can transition through neutral to oversteer with a boot of throttle exiting tighter bends, but road feeling seems like it’s filtered through thousands of pounds of metal, leather, and rubber. By the time it reaches the driver, it’s been censored enough that the feeling of involvement is minimal. As with other BMW M models, the M6’s steering, throttle, shift response, and suspension can be set to varying modes from Comfort to Sport+, which is always a horrible choice for anything but a racetrack. Best to leave everything in Sport if you’re trying to play race-car driver. But let’s face it: Anyone buying an M6 under the pretention that it’s a light, nimble sports car is woefully misguided and should have bought a Porsche 911. M6 buyers want a car that will look cool getting to the office in rush hour traffic, look cool sitting in a luxury condo parking garage, and look cool parked in front of the newest gastropub. The M6 will do all of these things very well, and it will even do them in relative comfort with the suspension set in the softest mode. The interior of the car is a very nice place to be, too. The seats are comfortable and the driving position is excellent, with a strong level of adjustment and a very comfortable steering wheel. The leather and carbon-fiber trim look expensive, and though you won’t fit anyone over 5 years old in the rear seats, they work well for storing duffle bags and could be used for emergency transport in a pinch. BMW’s current generation of i-Drive, which controls climate, audio and more, continues to work well. We experienced no issues getting our iPhones to pair up. compromise. Too bulky to play sports car on the best back roads and too high-strung to soak up the miles in comfort, the M6 tends to fall into an in-between space. Possibly the best thing about the M6 is cruising up next to a 650i at a stoplight, casting a sideways glance at its driver, and then leaving said 650i in a cloud of smoke and a spray of gravel as you exit your country club. But if you’re a dyed-in-the-wool enthusiast looking for an everyday supercar with soul, there are better options available. This entry was tagged auto repair, auto repair laguna niguel, bmw, bmw coupe, bmw m6, motortrend. Bookmark the permalink.